Beautiful woodwork is reason enough to visit Aldo's once, but it's the well-wrought Italian cucina that will bring you back for more. 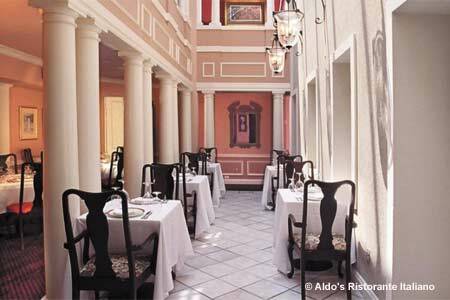 : Aldo's is so beautiful that, depending on where you sit, you may feel like you're dining inside a tapestry-lined palazzo or outside on a romantically lit piazza. A seat on the second floor could place you in an Art Nouveau dining room with millwork or inside a grand boardroom. That woodwork is hand-wrought by the owner, chef Aldo Vitale, a carpenter before he took to the stoves. The menu is influenced by Vitale's native Calabria, but also rounds up the usual suspects, such as linguine with clams and veal saltimbocca, with aplomb. The house's signature dish of foie gras-wrapped tournedos Rossini with black truffle and wild mushroom sauce is dependably lush, with tender osso buco running a close second. Pasta lovers can indulge in Aldo’s “degustazione of pasta” --- choose two to three pastas or order a half portion of pasta as an appetizer. The wine list includes intriguing Italians.